Jill McElderry-Maxwell ’91 cuddles 6-month-old Chakotah’s Maethonin, known as Ninny, while husband Bruce ’92 holds onto WRSR Peruvian Payday, their 6-year-old main herd sire. Photo by Fred Field. She loves raising alpacas. He loves teaching computer science. She’s expanded her herd of alpacas. He’s expanded the number of computer science majors at Colby College. She calls herself a technological Luddite. He admits that scooping alpaca poop is not his favorite chore. Time out: How did Jill McElderry-Maxwell ’92, a biological anthropology major who always wanted to be a farmer, get together with Bruce Maxwell ’91, an engineering and political science major who started programming when he was 10? “During my junior year at Swarthmore, Bruce put on a charm offensive,” Jill explains, “and it worked.” What also has worked is the couple’s willingness to accommodate each other’s deep yet different passions in a way that satisfies them both. Early in their marriage, they lived halfway between Kent State (where she was pursuing a graduate degree in physical anthropology) and Carnegie Mellon University (where he was pursuing a Ph.D. in robotics) in Pittsburgh. Every morning, they drove one-and-a-half hours in opposite directions. Jill followed Bruce to the University of North Dakota where he had his first teaching position. There, Jill began researching alpacas. 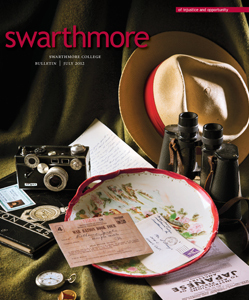 In 1998, they returned to Swarthmore where Bruce took a tenure-track position in the engineering department. While teaching computer engineering at Swarthmore, Bruce stepped up his work in robotics. He and his students competed in robotic waiter events, during which robots would serve hors d’oeuvres, or in robotic urban search-and-rescue competitions. Jill began helping out on an alpaca farm, mainly with halter training, teaching the animals to be tolerant of being touched. 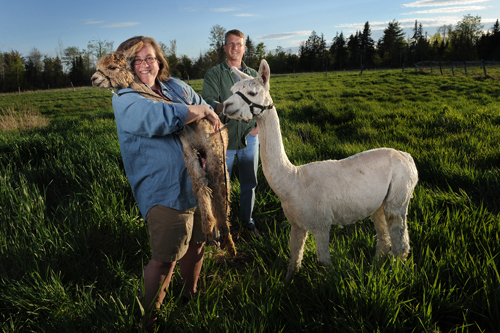 “I got a risk-free education in alpaca farming,” she jokes. Their son Fox, then 7, would often go along to help. “He loved it,” says Jill. Jill decided she’d like to move to a part of a country where there was little traffic and ample space to start an alpaca farm. Luckily, Colby College was looking for a computer science department chair, so the entrepreneurial pair moved to Maine in 2007. As the computer science chair, he’s worked to connect the discipline with the campus and with the rest of the world. Jill, the proud owner of Bag End Suri Alpacas of Maine L.L.C. has taken equally long strides in the alpaca farming field. She owns 35 alpacas (16 males and 19 females), a “guard llama” (yes, the guard llama protects the alpacas), and an assortment of fowl. She sells the raw fleece or has it processed into roving for knitting. She also shows her best alpacas in competitions. Recently, she had just returned from the Mid-Atlantic Alpaca Association Jubilee in Harrisburg, Pa., the largest alpaca show in the nation with more than 300 suri alpacas (the breed she raises) and 700 huacaya alpacas (the other common breed). In a few weeks she was scheduled to take four of her “girls” to Maryland to breed with one of the nation’s best male alpacas. Limited space precludes a description of what determines alpaca quality; let’s just say that Jill knows what’s what when it comes to alpacas. In addition to farming, Jill has served as a board member on the Maine Alpaca Association and currently serves on the Education Committee for the Alpaca Owners and Breeders Association and ARI Alpaca Registry Inc. Always ready for the next adventure, Bruce and Jill are preparing for their move to their new 137-acre farm in Pittsfield, Maine, purchased from the Maine Farmland Trust. This fall son Fox, who is as gifted and adventuresome as his parents, will begin his studies at the Maine School of Science and Mathematics, Maine’s premier magnet school in Limestone.